Yangon, Myanmar – Dee De, an ethnic-minority activist living in Myanmar’s eastern Kayah state, remembers the moment police began firing on a crowd of some 5,000 people who gathered to protest a golden statue erected in the state’s capital. The statue at the centre of the protest was of General Aung San, the father of current de facto leader Aung San Suu Kyi and the man regarded as a hero of independence, his fading portrait found in homes and tea shops across the country. But despite Aung San’s iconic status, the government’s decision to erect golden statues of him across Myanmar has ignited outrage among ethnic communities. They say the the statues are a symbol not of heroism but policies that diminish the rights of the country’s ethnic minorities. 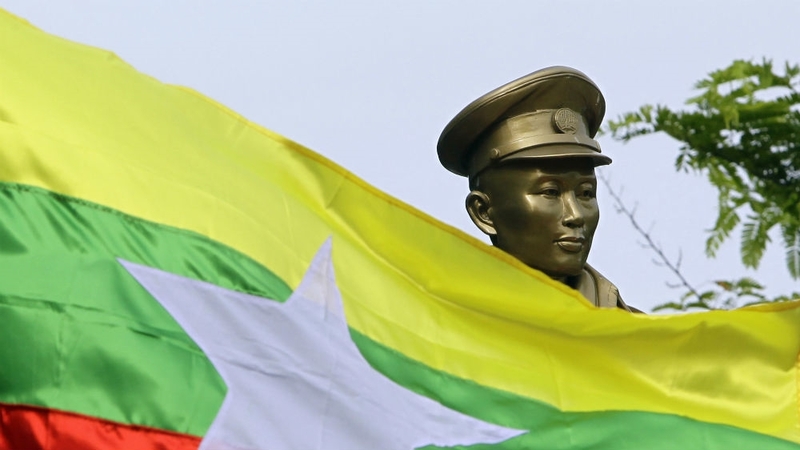 In 2018, the Kayah state government announced a plan to build a statue of General Aung San in the state capital – Loikaw – a move later endorsed by Aung San Suu Kyi’s National League for Democracy (NLD). “In these more open times, the appearance of many Bogyoke [Aung San] statues in many parts of the country makes up for the suppression of the past,” NLD spokesman U Win Htein told Yangon-based News Watch Journal in December. “Bogyoke” is a Burmese honorific meaning “General” that is commonly used as a nickname for Aung San, who fought for the end of British rule in Burma. Party leaders thought the statues would appeal to the country’s ethnic minorities who make up at least one-third of the population. It was, after all, Aung San who signed the 1946 Panglong Agreement, which granted a significant amount of autonomy to the ethnic states in Myanmar’s borderlands and the promise of a federal system to bring an end to ethnic conflict. But the dream was short-lived. In 1947 Aung San was assassinated. The years that followed saw increasingly centralised rule under the military – dominated by the majority Bamar. All ethnic minorities’ cultural practices – including language, celebrations, and literature – were banned. In 2015, when the NLD won the country’s first democratic elections after decades of military rule, many ethnic minorities felt the change Aung San had promised would finally happen. But they soon realised that would not be the case. Violence between the military and armed ethnic organisations has flared across the country, displacing hundreds of thousands across predominantly ethnic-minority states such as Shan, Kachin, Kayin and Rakhine. In August 2017, Burmese security forces drove more than 720,000 Rohingya Muslims into neighbouring Bangladesh during a brutal crackdown in response to attacks by the Arakan Rohingya Salvation Army (ARSA). The United Nations investigators later concluded the army’s actions showed “genocidal intent”. But the Myanmar government has refused to criticise the military. When the government began to erect Aung San statues without consulting local people, many non-Burmese suspected it was more “Burmanisation”, especially in Kayah state, which has a distinct history. “Karenni people highly respect General Aung San but they have been persecuted by the military juntas and Burman politicians,” said Nickey Diamond, a Myanmar specialist with human rights organisation Fortify Rights. With each month, demonstrations grew. Last July, police broke up the protests with violence, charging people for distributing leaflets and breaching the Peaceful Assembly and Peaceful Processions Law, which critics say is used to stifle freedom of expression across the country. Then on Union Day last month – the day that marks the signing of the Panglong Agreement in 1947 – protesters staged their largest-ever demonstration against the statues. Youth activist Thinzar Shunlei Yi said it shouldn’t have been necessary. Violence during the protest quickly escalated. Human Rights Watch said there was “excessive use of force” including water cannon, tear gas, and firing rubber-coated rounds into the crowd. More than 20 people were wounded, while 55 were arrested for violating the Peaceful Assembly and Peaceful Processions Law. Yanghee Lee, the United Nation’s special rapporteur on the situation of human rights in Myanmar, condemned the police violence. “This is yet another example of the government sidelining the rights of ethnic minorities and failing to truly do what is necessary to unite the country and bring about peace and democracy,” Lee said in a statement. Kayah government officials could not be reached for comment. Ethnic minorities in Kayah are not the only group to consider themselves victims of modern “Burmanisation”. In 2017 a bridge in ethnic Mon state was named after Aung San, despite objections from locals who had requested it be named “Yamanya” – which means Mon state in their language – or “Thanlwin” after the river beneath it. An Aung San statue erected in Myanmar’s northern Kachin, where civil war has raged between the Kachin Independence Army and the military for almost 70 years, was attacked with green paint. 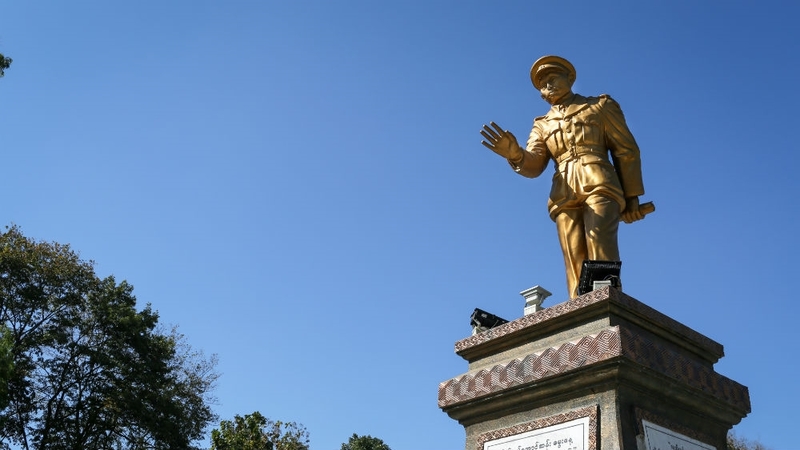 The military has also blocked actions by the Karen National Union – a semi-autonomous legislative body operating within ethnic Kayin State – from erecting a statue honouring the group’s founder, Saw Ba U Gyi, who died in 1950. For Dee De, the disputes show the fight for the rights of ethnic minorities that started with Aung San is far from over.